This elegant, vintage inspired classic lace dress was absolutely perfect for my wedding, and I am sure it will be for yours too! The dress is comfortable, which was a must for me! I am 5 ft 1 in.and wore 3 inch heels, and had the dress shortened so it barely skimmed the ground. I did not have to worry about lifting it up all day, or tripping over it. The lace A-line style fit our minimal elegant wedding theme. 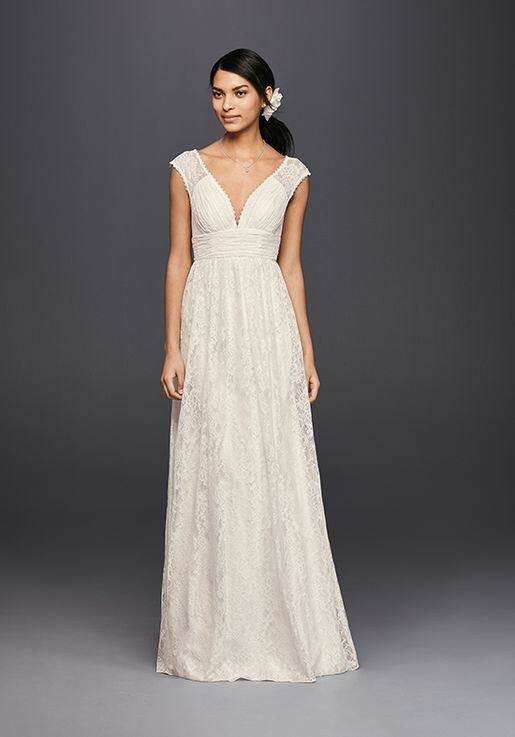 The dress has capped lace sleeves and a sweetheart neckline. The other alteration I had done was the top sewn together a little to make the neckline slightly higher. These seams could easily be removed to restore the dress to its original state. I am a 32 C bra size, and the cups were a bit big for me. I had to add a strapless padded bra underneath. The back dips low, but not too low, culminating in several elegant lace buttons that hide a zipper and hook closure. The dress's silhouette would be flattering on everyone. I absolutely adored wearing this dress, and did not want to take it off at the end of the day! Dress has been worn once, for about 6 hours, and stored in a smoke-free and pet-free home since then. Davids Bridal gown bag will be included in purchase.